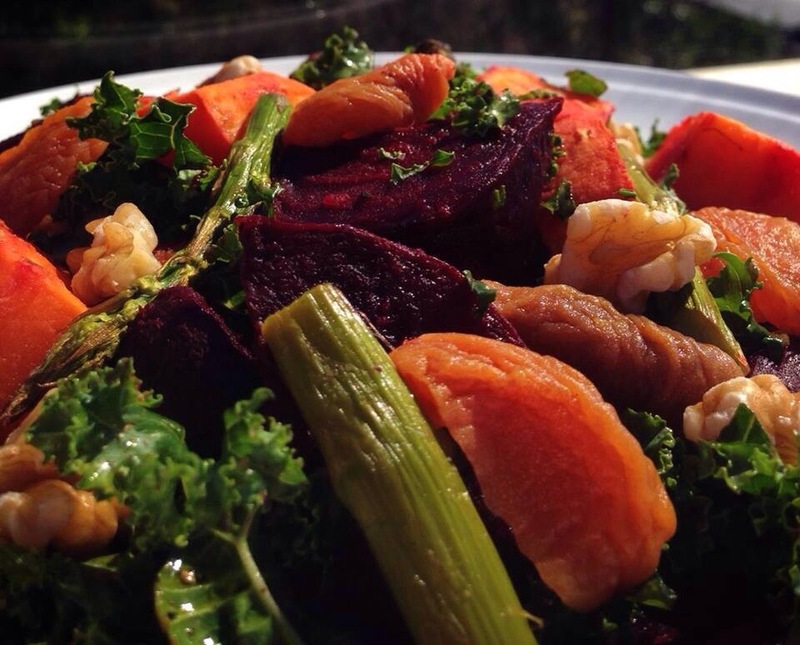 Kale, sun dried apricots and beetroot salad. The tangy taste of the sun-dried apricots teams up really well with the crunchiness of walnuts to give this salad an interesting twist on flavours. The Beetroot and the grilled sweet potato introduce a lovely sweetness which contrasts quite well with the sourness of the dressing. 2 tablespoons, apple cider vinegar. Wash the beets and scrub, cut in half if they are small or quarter them if medium size and place them in a pot, skin side down and cover with water only half way, bring to boil and simmer for about 20 minutes or until just cooked but still firm. In the meantime peel the sweet potato and slice into 1.5 cm thick slices and place under the grill. Brush with a bit of olive oil and flip to the other side when it starts to go golden brown, remove and dice. Cool the beetroot under running water, drain and remove the skin off the beetroot and place under the grill, flip after about a few minutes and grill for a few minutes until a bit dry. Grill the asparagus under the grill for a few minutes. remove and cut into three pieces each. Sun-dried apricots are much drier than other dried apricots. Soak them in the vinegar and add enough water just to cover. Soak the walnuts in cold water, also just to cover. Soak tamarind pulp with 1/4 cup of hot water, soak them all for 20 minutes. When ready remove apricots and walnuts and discard the liquid and water. Break the walnuts into small pieces. Press the tamarind bulb in your fingers to release the juice, strain and discard seeds and skin, reserving the liquid. Slice the kale into 1 cm strips. put in bowl and add the lemon juice, olive oil and tamarind liquid on top. Add salt and pepper to taste and mix well. 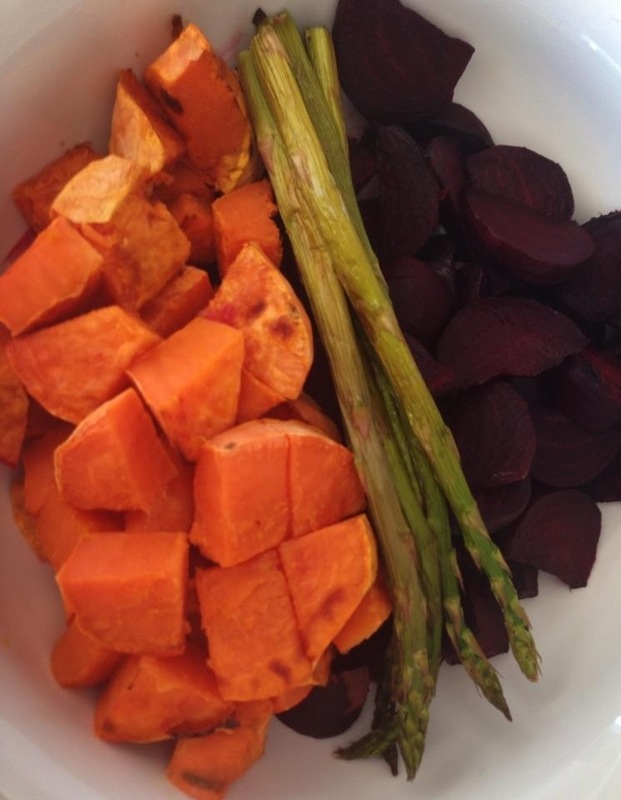 Add the sweet potato, beetroot, asparagus, walnuts and apricots, Mix together and serve. 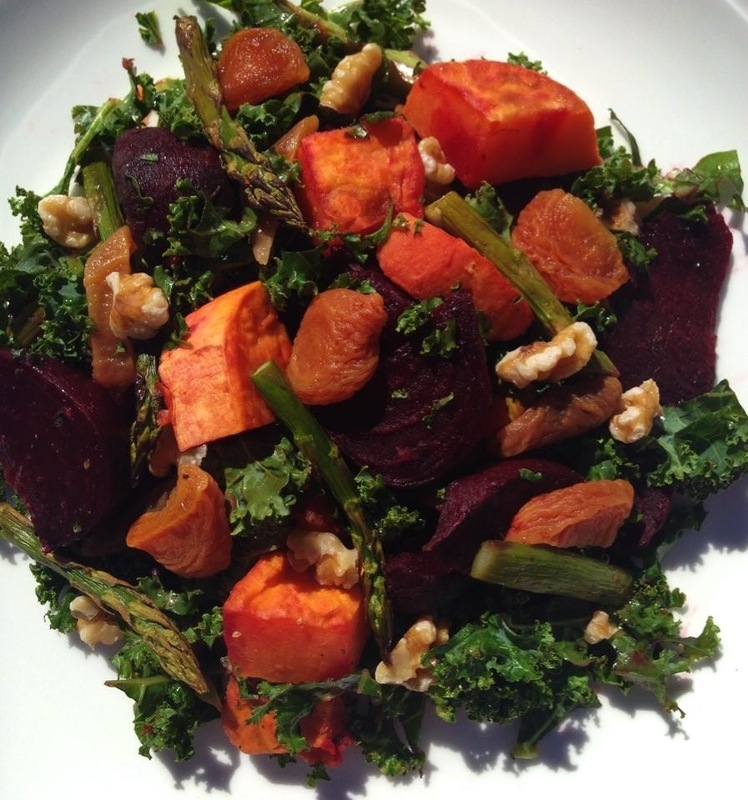 Tags: beetroot, diet, food, gluten free, healthy, kale, life, recipes, salad, vegan, vegetarian, walnuts. Bookmark the permalink. Thank you : ) I love tamarind and it works really well here. Extra points for including tamarind in this recipe! This looks awesome. Yum! Such a delicious combination of ingredients and flavors! Thanks, I particularly love the tangy, sweet combo in this salad. Oh my goodness this looks amazing!! Literally love everything on this salad. That’s great Ani, Thank you for your lovely comment.